You’d think the world’s cigar manufacturers would be weary to introduce new products in the wake of the Senate’s proposed 20,000 percent tax hike. Thankfully, you’d be wrong. Last week there were three – count ‘em, three – major announcements of new stogies that will be hitting a local B&M near you soon. What follows is a quick wrap-up of that news. Despite carrying a laughable warning cautioning buyers to “smoke while sitting down,” Rocky Patel landed another hit with his newest line, The Edge. The once naked cigars have sold well with both corojo and maduro wrappers. Aparently, Rocky wants the line to live up to its warning, so he’s now making them available in Sumatra wrappers. These promise to be the most full-bodied of the three. Not unlike Rocky, it seems as though everything Jose “Pepin” Garcia touches these days turns to gold. That bodes well for a new limited edition cigar called the Cabaiguan Guapo. Garcia teamed with Pete Johnson of Tatuaje to create this five and 5/8 inch by 54 ring gauge Nicaraguan that retails for $11. If you want one, I’d start looking now; they only made 50,000, and they won’t be rolling more. If you’re into rum, you’ll probably want to give Aurora S.A.’s newest offering a try. As Cigar Aficionado reports, the company’s new Corojo Oscuro Barrel Aged stogies are composed of tobacco that was aged in old rum barrels. They debut at the RTDA Trade Show in early August (along with many other new cigars) and will cost $6 to $9 apiece. Yeah, I too always thought the warning on The Edge was a bit silly. While I enjoy the line, it certainly doesn't merit caution. I look forward to seeing how they smoke with Sumatra wrappers. Over the past 2 weeks I've probably burned through about 20 Edge Sumatra. It's an awesome cigar. 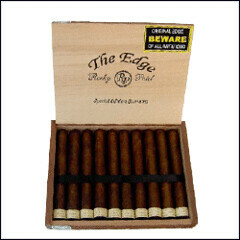 Actually, this cigar was the original Edge, which was never released. It was shown at a previous RTDA, but never hit retail shelves. The year after, it was released in Corojo and Maduro format.